The Radius M400 is actually NOT the same radio as the Maratrac. Although they do use the same software, the VCO boards are physically different. The Radius M400 uses a MaxTrac / Radius type VCO board, whereas the Maratrac uses a unique VCO board specific to it. The standard Maratrac & M400 software does not allow out-of-band programming by using the SHIFT key, but the Maratrac Lab software allows direct out-of-band frequency entry. Something in the Radius M400 does not allow the PA to operate outside the specified band limits of 450-470. This appears to be a firmware or software limitation. When the radio was programmed, it received beautifully in the ham band, but put only milliwatts of power out. The Maratrac on the other hand has no problems operating in the amateur band as we've been told. The M400 is a suitable radio for use in the 450-470MHz band, but it IS internally different than the Maratrac. The M400 Programming Port is the same as a standard Maxtrac / Radius Mic Jack. You can plug in a Radius microphone and use it to key the radio, talk on the radio, etc, it's the SAME THING. Check out the programming cable. Now, don't email us asking why this is the cable since you can't find anywhere to plug it in to. You may have to pop the lid on the transceiver and there is a jack on the front interconnect board where you plug in programming cable, click here to see where. The 16 channel and the 8 channel clamshell head are electrically the same. The only difference is the label and what the switch label says. 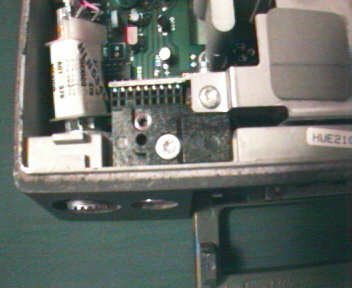 All you have to do is change it to clamshell with scan in the RSS and program the scan list and also the hang-up box, if used, has to go between pins 24/27 not 27/30. You can find the pinout of the control head cable here. The siren for the Maratrac can be used in a stand-alone application, you do need the DEK (direct entry keyboard) with the control buttons in order to use it though. The part number for the Maratrac DTMF microphone is HMN1022 (for an A7 head). There is an advanced head for a Maratrac that has a squelch knob on it, yes it is factory. The audio/squelch board is different on the radios that support the squelch control. Drawers with a HLN5342ESP01 audio/squelch board can use the head mounted squelch control, older ones will not. You can view the board component layout as well as the schematic diagram of the HLN5342ESP01 audio/squelch board. 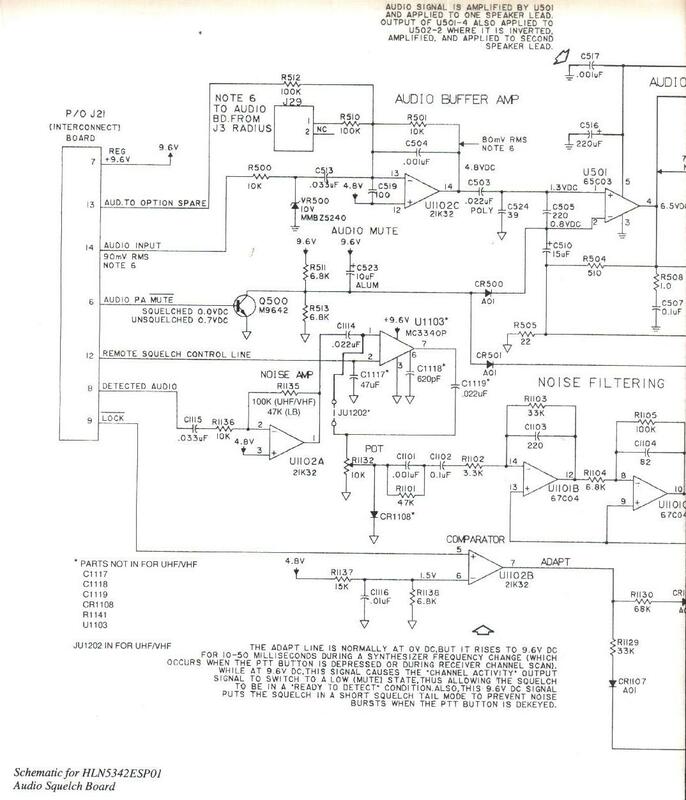 The rest of the schematic can be found in your Maratrac Service Manual, this is the only important part with the comparator circuit used for the squelch knob. The M400 also has a Radius style 16 Pin Accessory connector inside it. This connector pinout is NOT the same as a normal Raduis. See below. ** - The terms IN and OUT here refer to audio going IN to and OUT of the option board. If you're not doing any audio processing, make sure that JU1501 is in the IN position. The pin numbering is here. 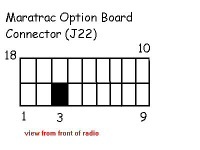 The only signal conspicuously absent from J22 is COR/COS, but never fear... It's available on the adjacent Audio Board connector, J21. By soldering a jumper between pins 11 and 13 of J21, you can make the SQUELCH_DECISION (read: COS) signal, appear at J22-12, the spare line. This is an active low that can provide COS to your controller or other equipment. Now, all the commonly desired signals are available on the easily accessible Option Connector. If ignition control is needed with the advanced head Maratrac (99 channel), jumper JU1003 inside the control head must be clipped. If your radio has ignition control enabled from the factory, you probably have the usual orange and green wires in your harness. These will need +12V to power up the radio. On many of the low band radios, they have an "extender" circuit built into the receiver. It is really an extended noise blanker. It is standard on most low band radios made by Motorola. It is good for blocking out noise (pops and hiss) on low band. If you need to program a Maratrac, and do not have a control head available, all is not lost. What you do need is a control cable from a Maratrac, Mitrek, Mocom 70, or Motrac. What you want to do is wire pin 17 and 13 to NEGATIVE, and pin 19 and 4 to 12VDC. This can be used to power the radio up. Then you just use the programming port in the radio to do the programming. This power cable can also be used to power up the radio to use as a transmitter without a control head. Again, you just use the programming port to access the PTT and mic audio pins. If you want to add PAC-RT operation to the Maratrac you need cable part number NKN6214B which has been modified for special application SP09. Click the link to see the wiring diagram of part number NKN6214BSP09. Add a Jumper from U551 Pin 1 to J1 Pin 16. This modification routes mobile receiver audio to the PAC-RT using the transmit LED wire. Transmit light function is disabled. These modifications are from the Motorola service bulletin and are to be used in conjunction with the above cable. Open the file indicated in your hex editor (such as Hex Workshop) and apply the changes you want, you do not need to correct a checksum once your changes have been made. The tables below show the locations in the file corresponding to each bandsplit. The first set of locations listed correspond to what is displayed in the Radio Wide Configuration screen as the bandsplit of the radio. The second set are the ones that affect what the RSS will allow you to enter and program into the radio. We only have the locations for the 450-470 bandsplit. It appears that you can program the Maratrac with Radius M400 RSS. The modifications apply to the M400OVL2.OVL file. The modifications apply to the MARATRC2.OVL file. Now that you know what locations you have to change, you need to figure out what to put in. It is fairly simple to figure out, you can use either the Base Converter in Hex Workshop, or any ordinary calculator that can do DEC-to-HEX conversions. For example, if you wanted to change the low end of the 450-470 bandsplit radio from 450 to 440... as you can see from the above pattern, you will need to convert 4400 from decimal to hex. When you do this you should get 1130. All you have to do is swap the high and low order bytes and you get 3011. This is the number you would replace the 9411 with and there you have it, your radio will now be able to be programmed from 440-470. Note however, that just because you can program the frequencies into the radio, it doesn't mean that the radio will work well there, if at all. In addition to the VCO coils, you'll need to make extensive modifications to the RF board (like changing out 20 or so chip capacitors). Its a good idea to sweep the entire front end before making the changes to try and shift the front-end curve up by 4 MHz. When you finish, if you're lucky, the sensitivity should be about spec. (0.35uV for 12 dB SINAD). It's a nice radio but a lot of work to convert, not to mention the need for the software that will allow you to program it out of band. The bottom line is that, unless you like spending few bucks on parts and several nights working under a magnifying glass, stick with the crystal bound radios - this one wasn't designed for amateur use. After programming up the radio out of band, you should be able to tune up the RF board the same way you do the low band Maxtrac using the SL point. More than 10 of these have been done using this technique and it works without a flaw. There is no need to change any parts on the board unless you want it broad-banded. Maratracs have been made to TX and RX as high as 56 MHz without loosing any power. So, what have you got to lose? Give it a try. Converting to 99 channels is fairly straight forward. First, you need the "advanced" control head (looks like a cheap X9000 head) and control cable. The radios are the same whether they are 8, 16 or 99 channels, it is onle the control head that is different. 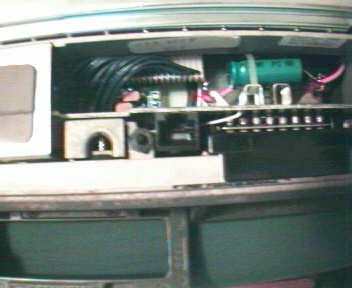 Then, all you have to do is power up the radio, it doesn't matter if it has the advanced or clamshell head, go into the Service Menu, and change the radio control head type to Advanced. That's it, go back in program in your extra channels. Someone in the Texas Highway Patrol uses this setup (you have to program the head with X9000 RSS and the Maratrac with Maratrac RSS). Supposedly it involves adding an interface board to the X9000 head. We do not have much info on this, but as is comes in, it will be added. So far, it looks like the interconnect board you need for this modification is HLN5343CSP01. The interesting thing though is in talking to some of the tech's at DPS, they like have never seen this combination. As far as they are aware, DPS never purchased a Maratrac through HQ. So, this is probably the work of a ham or a county owned combo, as the HQ radio shops only purchased and installed VHF Syntor X9000, Spectra 9000, and Astro 9000 mobiles. We have been told positively that the 9000/Maratrac combo was not a standard installation. In 1985 DPS bought the first of several large amounts of Syntor X9000's with integrated sirens. In 1995 they started replacing them with System 9000 Astro radios. The siren controls are integrated with the main control head (No DEK boxes).